The Livestrong LS10.0 is the next model up from the Livestrong LS8.0. It includes a 23 lb flywheel for a smooth and quiet elliptical motion while the 20 inch stride length provides for full range of motion. For optimum comfort and to minimize stress to the feet, ankles and knees, the foot pedals are designed to mimic the way people naturally walk and run. Maximum user weight is 325 lbs. With the Livestrong LS 10.0 you can choose from 20 levels of resistance and the 5 manual incline levels available on the LS 8.0 are now 20 levels of incline at the push of a button, sufficient to provide a strenuous workout to even the fittest user. The display provides all necessary information in an easy to read way and you can download training programs and track your progress on Livestrong.com and a cooling fan will help keep you going. 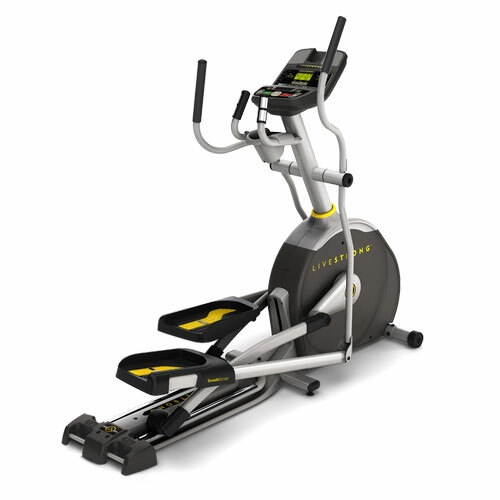 Coming in under $1000, the Livestrong LS10.0 provides a quality elliptical trainer and the automatic incline controls makes it a very appealing choice.